Ho Ho Ho… It’s Christmas Time on the rocks!!! visiting the Christmas markets and enjoying special dishes and a good glass of mulled wine! Valletta European Culture 2018 is proposing an amazing New Year’s Eve event to ring in the 2019 at its best! 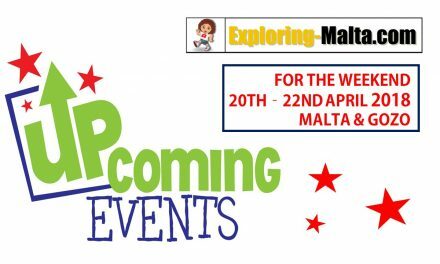 Let’s have a look at all the events scattered around the island and Let’ Go! Starting from 1st December through the festive season, the historic Valletta Waterfront will take a Christmas Village feel with a mix of décor, music, food and activities related to this magical time. A Christmas tree measuring over 35 feet has been set up in the central part of the promenade. Adjacent to it one can find Santa’s House and Workshop, and his enchanted snow garden. 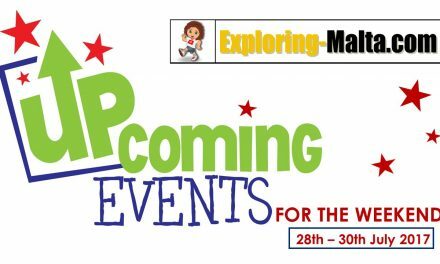 A variety of free activities are planned throughout the month: Christmas bands, children choirs, a traditional Maltese crib, reading sessions, children’s entertainment and more. 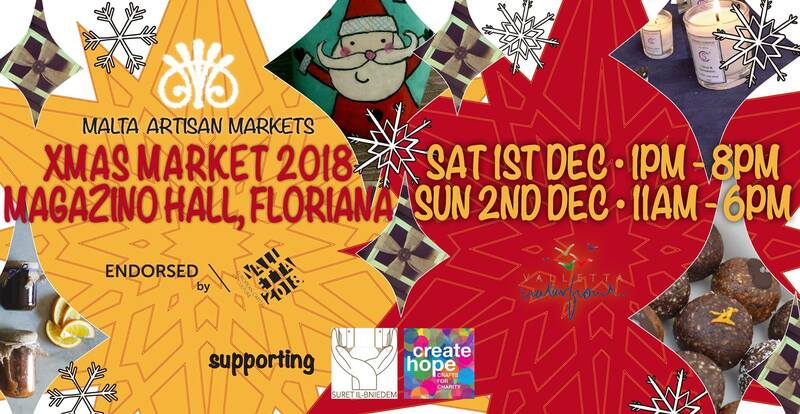 Malta Artisan Markets invites you to the Christmas Market 2018, at Magazino Hall, Floriana. Saturday 1st December 1pm-8pm and Sunday 2nd December 11am-6pm. 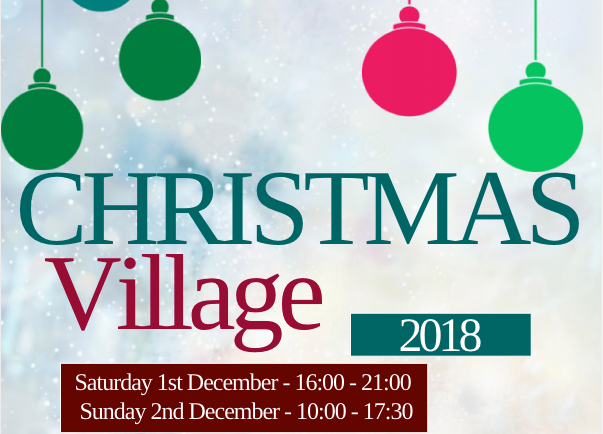 Our Christmas Village is back once again! 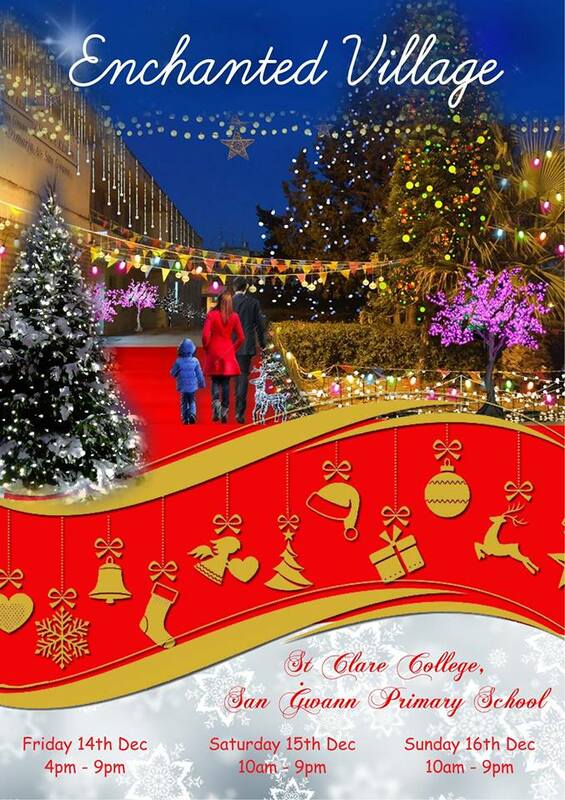 Our school will be transformed in a lovely Christmas atmosphere for you to enjoy! You will find traditional decorations on sale, home & hand-made accessories, cards, gift ware, books, toys, children`s gifts, jewellery and many more gifts for the perfect Christmas shopping! Kids will also have the opportunity to take a photo with Santa in his own workshop! Food, refreshments, mulled wine, coffee, mince pies, christmas logs and other delicious cakes and items will be available from our kitchen area! Entrance is FREE. This is a Guardian Angel Resource Centre fund-raising event. 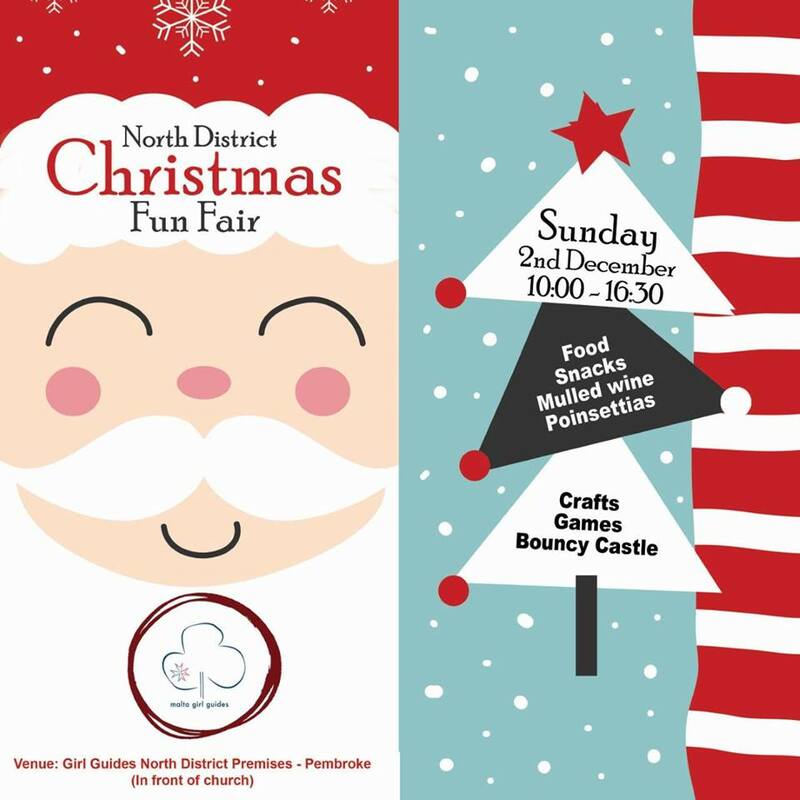 Once again, the North District Girl Guides are organising a fundraising event. Come join us for pony rides, games and hand made Christmas crafts by our very own talented girls in a family friendly environment. Tingle your Christmas taste buds with our homemade various Christmas treats including mulled wine, mince pies, roasted chestnuts and much more! We will be welcoming the Police Dog Show at 11:30am. Following this, we will be having a Fire Engine show by the CPD at 1:00pm. 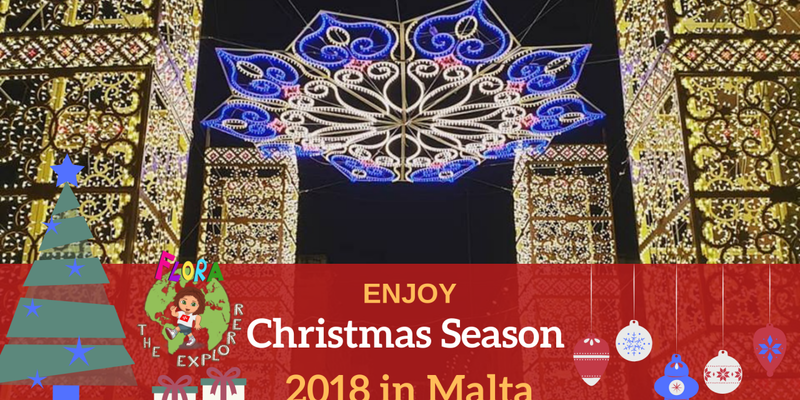 Malta’s very own Christmas Village is back for the 3rd time running! 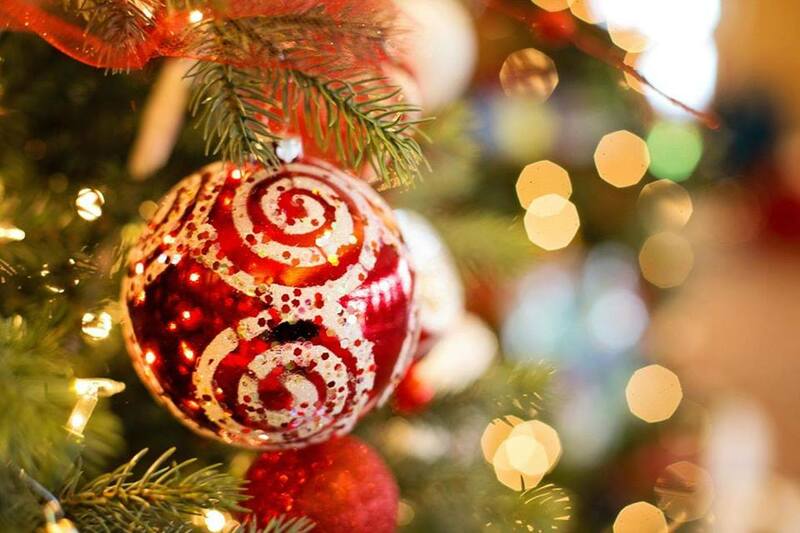 A 7-day event that will transform Rabat’s historic core into a Christmas wonderland. 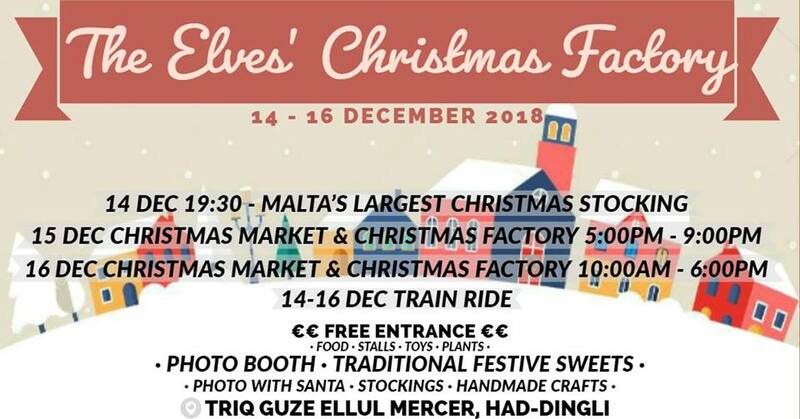 Around 100 stalls will form Malta’s largest Christmas Market, while historic building will be hosting various Christmas-related activities, such as the Nativity Trail within the Franciscan Friary’s Secret Garden, the Natalis Notabilis Crib Exhibition located in a 500 year old convent, Ta’ Gieżu Church will be hosting a number of choir festivals. A new drama production ‘Il-Klarinett Maġiku’ will be held at 18th Century Palazzo Xara. Entrance to the Christmas Market is FREE. 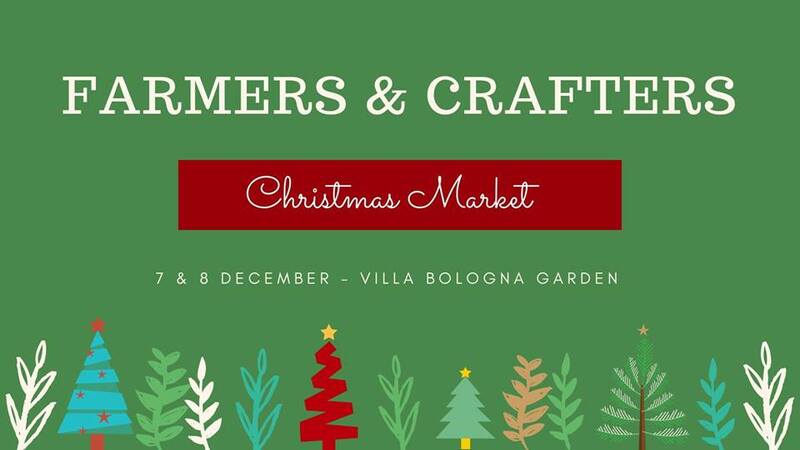 Crafters meet Farmers offers visitors a curated selection of handmade products, fresh local produce and a place where to saunder in nature. The event will also include music, decor, tour of the garden, tour of the pottery factory and workshops for children. Let’s have a festive day in nature! 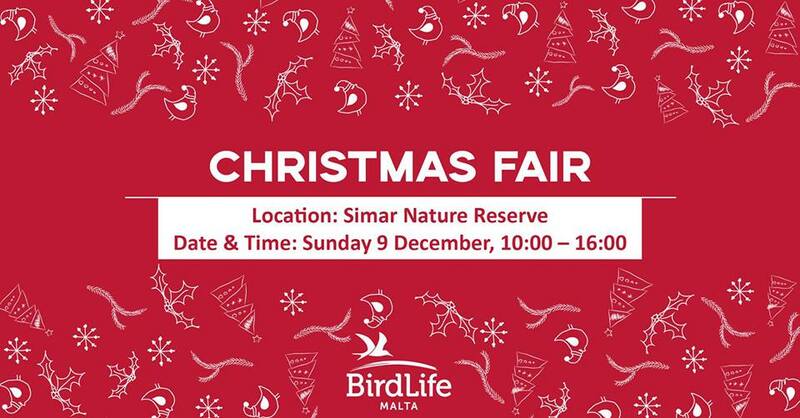 For the second consecutive year, we are organising a Christmas Fair at Simar Nature Reserve! There will be stands from different organisations as well as educational games and activities especially for families and children. The Christmas Fair is an opportunity to enjoy the outdoors and get closer to nature and wildlife during the winter season. 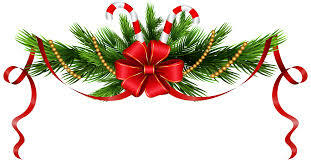 At the same time those attending will be engaged with fun-filled activities and games related to the festive period. At this year’s event, we will also be holding a presentation on our project Birdtourise focusing on sustainable birdwatching tourism in Mediterranean islands. Find out more about the project and its results, participate in a questionnaire with a reward for most number of correct answers, and enjoy a private tour of the reserve! 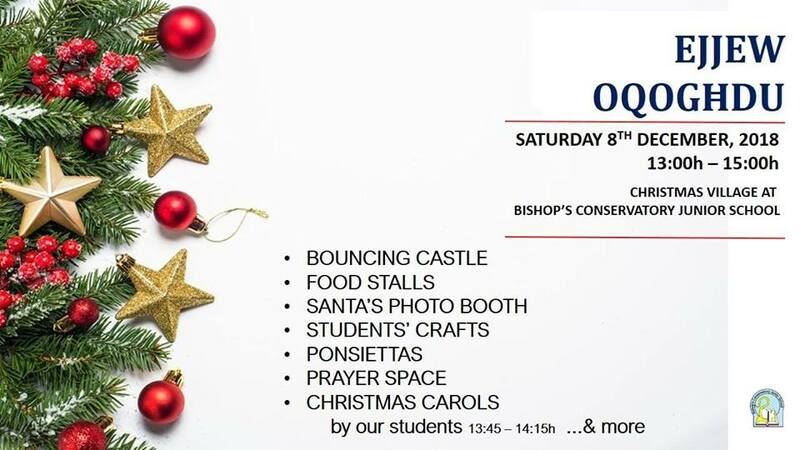 Poinsettias, Christmas Carols, Bouncing Castle, haven-decor gifts, students’ crafts, Prayer Space, pan-cakes, Santa’s Photo Boot….& more.. The Naxxar Local Council invites you to the inauguration of the new set of Christmas lights in Labour Avenue. Enjoy the lovely Christmas athmosphere in the Naxxar village. Due to the great response to last year’s first ever Christmas Factory in Malta, we are back again to present you with this years edition. PLACE: Mediterranean Conference Centre, Valletta. Malta’s most anticipated Magical Christmas show is back for the 4th consecutive year as the Mediterranean Conference Centre is expected to turn into one energetic concert on Saturday 15th and Sunday 16th December 2018. 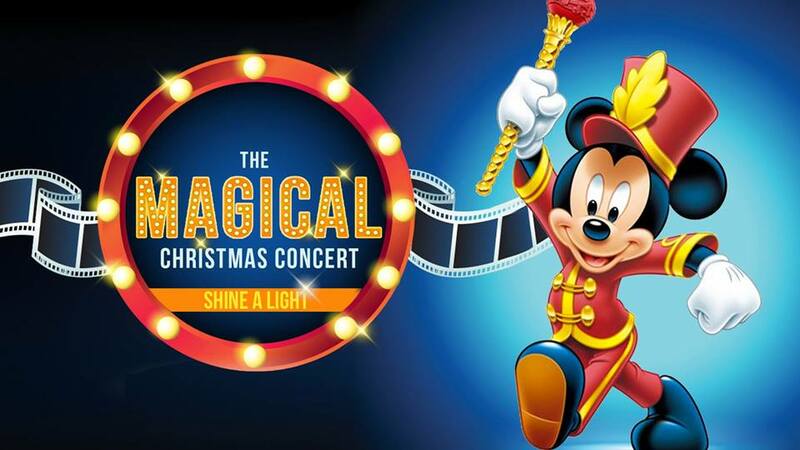 Shine a Light along with Mickey and Minnie together with the Malta National Children’s Choir. 90 minute of greatest hits and soul-baring performances including latest hits, Christmas songs and music from Disney’s repertoire. Lively rhythms to make any person of any age sing and dance. Surely an alternative, yet fun for all children with spectacular visuals, synchronised lights, animation and interactive games. The concert will be creatively produced, choreographed and augmented with performances by guests artists. 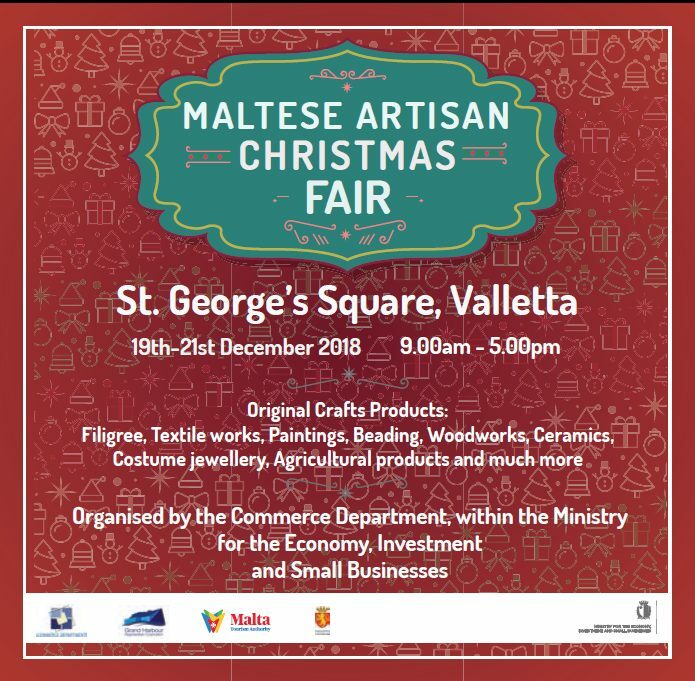 The CHRISTMAS MALTESE ARTISAN FAIR features over 45 artisans showcasing and selling their fine and original hand-crafted products. The great diversity of artisanal products will ensure that you will find something for everyone on your shopping list. Don’t miss this great opportunity!!! 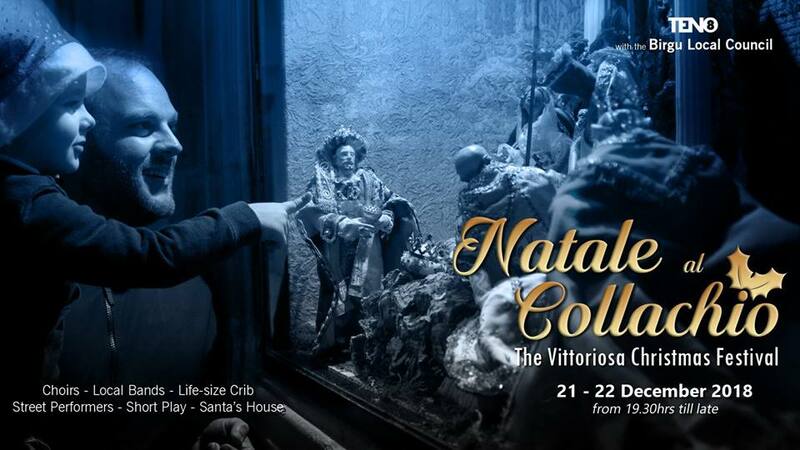 For the first time ever, TEN08 together with the Birgu Local Council are organising Natale al Collachio – The Vittoriosa Christmas Festival, on the 21st and 22nd December. Birgu’s core city centre and its narrow and winding streets will be literally transformed into a Christmas village with decorative Christmas lights, children’s choirs and festive music all throughout the 2 day event. Book your calendar, and come visit the City of Birgu on the 21st and 22nd of December! The 1st edition of San Ġwann Primary’s Christmas Market is taking place this Christmas season on Friday 14th, Saturday 15th and Sunday 16th December. This 3-day event will transform our school into an Enchanted Village. Apart from the stalls which will offer a unique shopping experience to all visitors, various activities for the whole family will take place throughout the whole weekend. 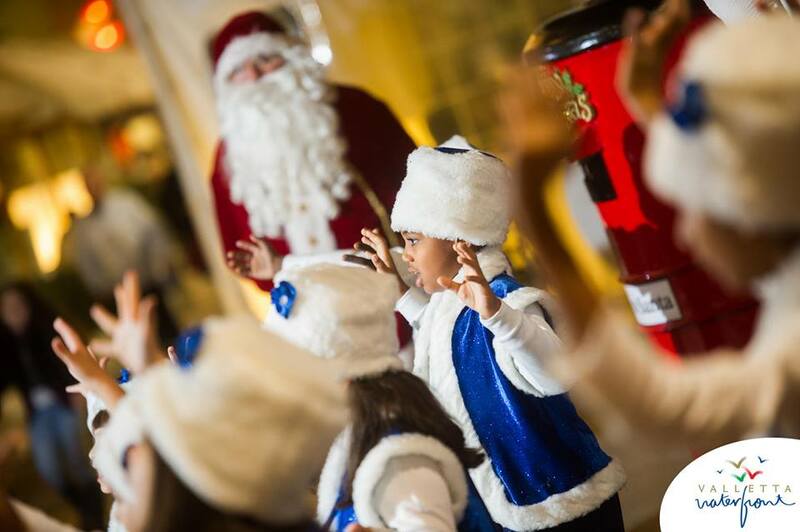 Kids will have the opportunity to meet and take a photo with Santa, listen to animated stories and have fun in the kids’ area. 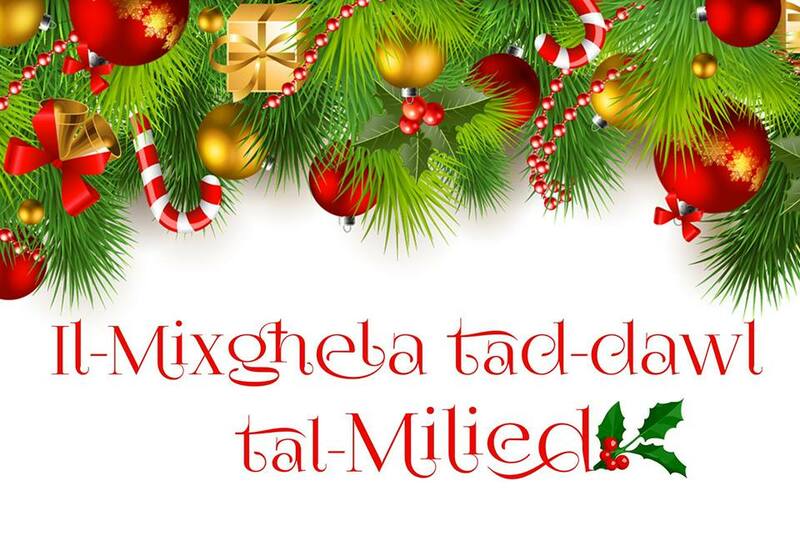 Our main stage will host a variety of Maltese talent to entertain you while treating yourselves to some traditional food and a perfect glass of mulled wine. All this and much more during the first edition of Enchanted Village. Entrance to this event is FREE. Join us on the 22nd of December from 7 in the evening till late, for a full night of music with a Christmassy atmosphere. ‼️ “Notte da Venerare – L Istrina f’Santa Venera” is a Christmas village organised by the Santa Venera Local Council in aid of “L-Istrina”. A line up of more than 80 local artists and a special guest from Italy is ready to rock the stage in St. Joseph High Road, Santa Venera! 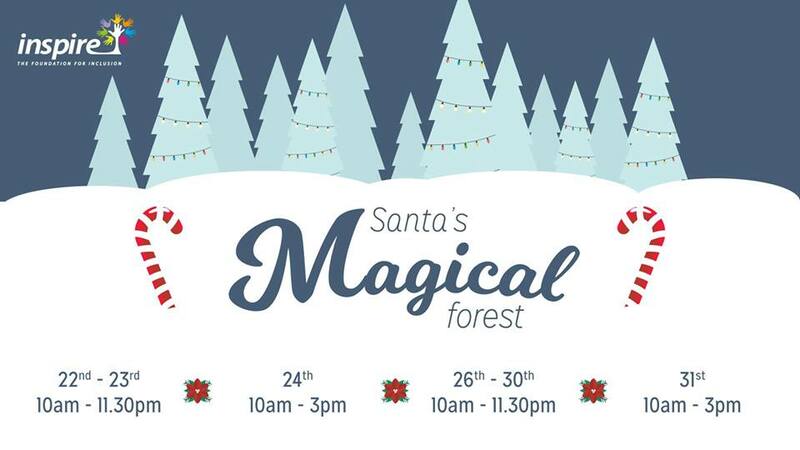 The Inspire Foundation for Inclusion would like to welcome you to Santa’s Magical Forest. Join us for 9 days of fun activities and entertainment for adults & children – just in time for the Christmas Holidays! This fundraising event will help us raise money to upgrade our Therapeutical Horse Riding facilities that greatly help in improving the quality of life of our members. For this year’s edition of its annual Christmas concert, the Malta Youth Orchestra, directed by its resident conductor Riccardo Bianchi, will team up with another youth ensemble, the jazz orchestra Big Band Brothers Jnr. The two ensembles will be playing a selection of Christmas-themed swing jazz and pop numbers, including original music composed by Alex Bezzina. The MPO’s principal percussionist Daniel Cauchi, who is also the founder and leader of the Big Band Brothers, will be singing vocal standards during the concert, along with a number of special guests. RING IN THE 2019 IN A GREAT STYLE! For New Year’s Eve St. George’s Square will once again host the main stage and will see the very best of Malta’s top local artists. The night will kickstart with local band Xarulu, followed by one of Malta’s biggest artists, IRA LOSCO with her band who will be giving us the very best including her chart-topping singles, “What I’d Give,” “Me Luv U Long Time” & her recent single “One In A Million” which is also included in her 7th album titled ‘No Sinner No Saint’. The event will be hosted by Corazon Mizzi and Owen Bonnici. Then it’s time for the energetic countdown by DJ Pierre Cordina who will be giving us a mash-up of the best dance anthems of 2018 together with stage special effects and fireworks to welcome the New Year. Finally, DJ Mykill and trumpet Live will close off this magical night. End the year with a bang and join in the New Year 2019 celebrations: entertainment for old and young will be provided with live bands and roaming children’s animation. 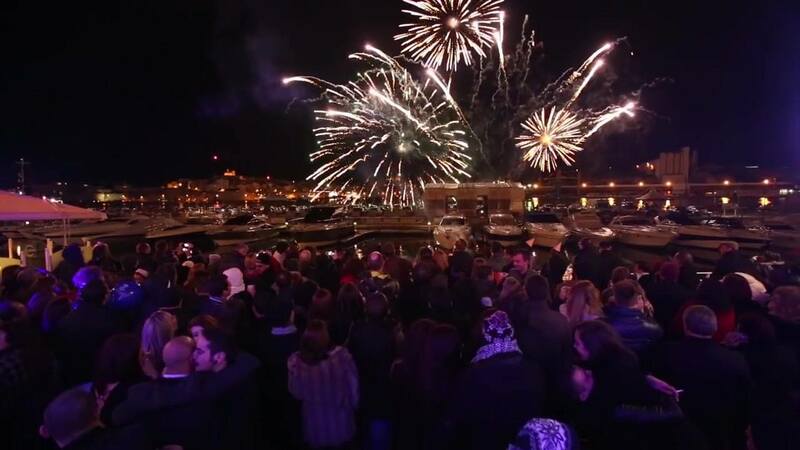 At the stroke of midnight, there will be an aerial fireworks display coupled with confetti on the Valletta Waterfront promenade, overlooking the historic port and fortifications. All outdoor events are weather-permitting. HAPPY CHRISTMAS FESTIVITIES TO ALL OF YOU!